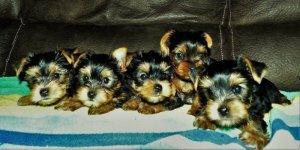 AKC Beautiful Yorkshire Terrier Puppies I have a male and 2 females available i will include 20 wet food and 4months worth of dry food, chew toys, cage playpin, plates, dog bed, new colar. He is also trained to poo and pee on wee wee pad. chocolate parti 3lbs dad is chocolate blonde 4 1/2 lbs pups will be dewormed tails docked utd on shots. The will be ready to go Serious inquiries only If seriously interested Call / Text me at(210)-628-9716 for additional information getting them.